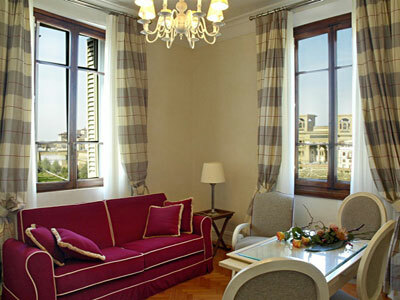 Serristori Palace is a carefully restored 19th century building, located in the heart of Florence historical centre. It's a true jewel in the magical setting of Piazzale Michelangelo and the enchanting Arno embankments, just a few steps away from the Ponte Vecchio and Pitti Palace. From its balconies you can almost touch the major monuments of Florence: Santa Croce, the Uffizi Gallery, Palazzo Vecchio, the Duomo. The Residence is composed of 12 tastefully and axclusively furnished apartment suites. Each apartment is completely independent and provided with all amenities.The "antique style of the architecture the building, the sobriety and sophistication of the furnishings, from the pastel walls to the elegant plasterworks, blend harmoniously with the modernity of the bold lines and functional tools equipped with the latest technology. Its strategic position means a stay full of comfort and culture: behind the building is the characteristic San Niccolò quarter, where you can still find traditional craft shops, and wander among the beautiful views of the historic monuments of the area. With just a few minutes' walk you can reach the city centre, experiencing the past and its traditions every step of the way. Palazzo Vecchio, Santa Croce, Uffizi. High Season: 01/Jan-05/Jan; 16/Mar-29/Jun; 31/Aug-02/Nov; 21/Dec-31/Dec. Low Season: 05/Jan-16/Mar; 29/Jun-31/Aug; 02/Nov-21/Dec.